Atrium Condominiums have an almost campus-like setting that makes them incredibly appealing, if their convenient location isn't already a siren song. The Atrium is located on the quiet south end of French Street next to Carter Park and this puts them just a short block or two east of the shopping, dining and entertainment of Main Street. From here, walk to Breckenridge Ice Rink a block south. For those searching for property convenient to the world-class skiing offered at Breckenridge, look no further. There is a free town shuttle bus that stops outside the door of the Atrium condos for sale to either peak of the Breckenridge Ski Resort. 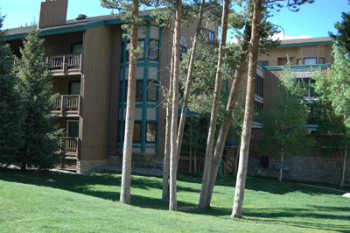 Atrium Condos for sale offer a low-maintenance living opportunity in Breckenridge, so that all you have to worry about is making the most of the snowfall on the slopes. Learn more about living in the Atrium or browse up-to-date Atrium condominium listings below. These condos were built before in-fill became the buzzword for in-town planning and zoning, and was designed as a campus of its own. Since then, a slightly dense single-family-homes neighborhood, an upscale neighborhood and a few redeveloped historic homes have clustered around the Atrium. When the Atrium condos, Breckenridge, were built in 1981 they included an athletic club and were laid out around a glass-covered lobby. 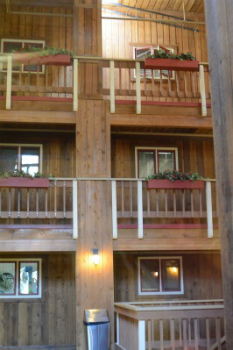 The front door of each condo opens onto this three-story atrium that drenches the interior with sun but keeps out the rain and snow. They were originally called the Chaparral Condos, and the location selected for them was adjacent to the main town park, Carter Park, where residents could find trailheads into the forest and facilities like tennis and volleyball. The Atrium Condominiums are surrounded by a grassy lawn and is a few steps to the park. With a community deck on the second floor which is always open - cleared of snow in the winter – residents can enjoy the more than 360 days of sun in Breckenridge. The free bus runs year round outside any Atrium Condo for sale, and a paved sidewalk leads downtown. Size: 825 sq. ft to 1562 sq. ft. Amenities: covered grand atrium, hot tub, Jacuzzi, a built-in natural gas BBQ grill, Laundromat, lawn, near park, at the bus stop, balcony, and common deck. Located on South French Street just a few blocks north of Boreas Pass Road. To get to the Atrium Condos take Boreas Pass Road, turn left after one block onto French and at the first bend (a few 100 yards) the Atrium will be on the right. If you are in town, go south on French Street, follow the sweeping left turn and The Atrium Condos will be on your left. We absolutely love the Atrium Condominiums and would enjoy telling you more about them. Call us at (970) 453-2200 or send us a message online to discuss living at the Atrium, or other Breckenridge condos for sale.